Nearly all hedge fund management firms are natural extensions of the career paths of the principals. The development of the firm is then a function of what the markets throw at the style of investing – that is, what those principals learn of their hedge fund experiences. In the case of Passport Capital, John Burbank taught English in China out of college, giving him an early interest in emerging markets. Burbank’s formative experience as a fundamentally driven investor was working on a global value-oriented fund at ValueVest Management. This was followed by a chance to learn about hedge fund investment techniques during 1999-2000 at JMG Triton Offshore while working as an analyst on a domestically focused arbitrage fund. The founder of Passport Capital says that he started the San Francisco-based firm in 2000 at a time when nobody wanted to talk about global investing. Maybe that is why it started with only $800,000 (today the firm manages $3.7 billion). The investment process at Passport Capital is a combination of deep domain expertise from the seasoned sector teams and a well rehearsed top-down view of the state of the world in a macroeconomic sense. This process is reflected in the firm’s flagship Passport Global strategy, which has an annualized return of 18.4% since inception. Burbank is opportunistic as an investor and somewhat contrarian. His development as an investor has continued at Passport Capital. This is relatively unusual in the hedge fund industry, as most of the time and for most hedge fund investment strategies investors are very unforgiving if a manager goes off-piste by varying from a dedicated mandate. Arbitrage managers are expected to stay in arbitrage, and long/short healthcare managers have to stay in healthcare. To a large degree this is part of the hedge fund manager bargain – investors in hedge funds pay high fees for deep but narrow expertise. The investors conceptually employ the best-in-breed who evidence the best process, information edge and risk controls for the specific strategy. As the hedge fund industry has developed, this investor demand for specificity has become nearly ubiquitous. Only large managers and those in the global macro and multi-strategy style boxes are allowed to freely allocate to sub-strategies. Generally the modern hedge fund manager is not allowed to roam. This makes Burbank something of a throwback. Maybe the backing of Capital Z in the early years of Passport Capital gave him confidence, or maybe the investment returns a decade ago did it, but Burbank has taken the chance to learn about and invest in new asset classes and securities as market opportunities have compelled him to. So from a background in international and domestic equities he has gone on to study and then invest in commodities, mortgage-backed securities, gold and emerging market plays. According to Burbank, the different disciplines may be in fashion in markets at any one time. So while a certain style may work for a while, he believes that there is a dramatically large benefit to returns in investing with a multi-disciplinary approach. As he sees it, American equity long/short hedge funds have spent the last five years learning to cope with how macro factors can impact their portfolios. This has been necessary because since the credit crunch macroeconomic and geo-political factors have been dominant market drivers. However, he suggests that what has not happened yet is that American equity long/short hedge funds as a whole have not fully addressed risk and liquidity as seriously as they have the fundamental/bottom-up or the macro/top-down. Hedge funds that are not run by quantitative managers are not looking at the world from a quantitative perspective. This is what Passport Capital started doing five years ago as a consequence of what they went through in the credit crunch. Traditional quants or economists will use historic data to build models to forecast the future. These are the “regression to the mean” thinkers. As regression to the mean is the price action with the highest probability of being correct, relying on it is how you can ordinarily lead your life. Regression to the mean is what is baked into market prices, says Burbank. When investors take risk measurements of portfolios it is mostly a backward-looking activity. Even scenario testing is a sophisticated way of re-running the past in this way of looking at risk management. Burbank does not want to limit the understanding of risk at his firm to the past. Most conservative decision makers need ten years of data before they change their view. For example, Greenspan’s Fed was caught off guard by the US recession after 9/11. But this was an inevitable consequence of years of technological advances and labour arbitrage that enabled a massive wave of outsourcing. He needed to have that phenomenon in place for a very long time before he changed his view. So the focus at Passport Capital is to identify what is subject to (big) change and what is not priced correctly. The bigger the trend or phenomenon at play the better, because it will impact more industries and companies and create greater price movement. The affected companies then have to be analysed to determine how much of the perceived change has not been priced in, whether it is positive change (a potential long) or negative (a short). That is where the deep analytical teams at Passport Capital come into play. As a long-time resident of San Francisco, Burbank acknowledges the proximity to Silicon Valley has influenced his thinking. “We are headquartered in San Francisco, one of the most extraordinary business centres in the world. People who work here seek and even expect radical change in the businesses they are working at. The members of the business community here want to have call options on the businesses that will benefit from what they are doing and put options on those that will suffer.” The portfolio construction of Passport Capital at times mirrors this operating preference. Burbank is not talking theoretically or prospectively about identifying large secular trends. It has been part of how Passport Capital has operated from inception. In the few years after the TMT bubble burst, Burbank took the position of a medium-term bear – reflecting low growth and an unwinding of excessive capital investment. He was early in spotting the travails associated with the housing market in the United States, going public in 2005 on the issue by owning credit default swaps on subprime mortgages. Partly from having built a strong foundation of knowledge on housing, it became clear to the Market Street macro maven that the mortgage-backed securities market was going to be a good way to express his systemic concerns. Passport Capital was one of the few firms that made fantastic returns from the Great Short in retail mortgage-backed securities (RMBS) – the firm’s Passport Global Strategy (which allocates to sub-strategies within the firm and runs positions itself) was up 219% in 2007. Burbank has a track record of identifying big macro changes. In October of 2011, Passport Capital added a mortgage team led by Jeff Kong, a former portfolio manager at Structured Portfolio Management. That strategy, Passport M1, returned 13% in 2012, deploying only modest leverage. 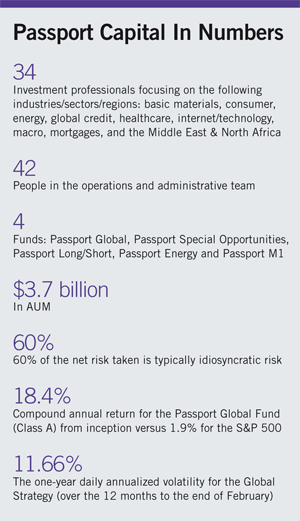 Passport Capital employs many of its analysts directly out of business school. It hires the best of its summer interns, and puts them to work building models, often in the team that has identified the newest big opportunity. Sometimes Burbank postulates that a big macro change is occurring in a sector and seeks the bottom-up information to corroborate or disprove an investment hypothesis. “Every change that is not a reversion-to-the-mean outcome is an investment hypothesis that needs to be verified,” he explains. By having analytical resources dedicated to specific sectors of the global economy and regions of the world, and not just the application of a generalised analytical capability, it is Burbank’s contention that a more rounded appreciation of all the risks inherent in a proposed strategy/position become possible. 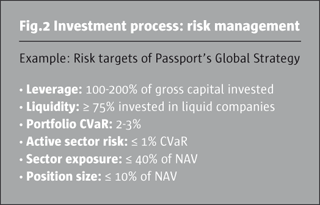 The more robust risk assessment from analysts should facilitate the assumption of investment risk with confidence at the portfolio manager level and to the CIO level in the case of the Passport Global Strategy. On the investment side the second most senior person at Passport Capital after Burbank is Tim Garry, co-portfolio manager (with Burbank) of the Passport Long/Short Strategy and chief risk officer. Garry also leads the firm’s quantitative team and is chairman of the firm’s risk committee. He joined the firm from State Street Global Advisors where he had been a quantitative portfolio manager. He was recruited to Passport Capital in December 2007 to help change portfolio construction. He says, “when I arrived at the firm it had a fantastic fundamentally driven alpha engine, but it needed an upgrade to institutional standards of portfolio construction and risk measurement.” His remit was to understand the business and alpha engine and to build a risk system that was empathetic to the strengths of the investment process, rather than bolt on a risk management package. In the early stages Garry noticed there was more tail risk than he expected in the distribution of returns Passport Capital had produced. This was a function of the sort of risks the firm was taking related to emerging markets, commodities and currencies. Risks in these areas are serially correlated – they are price trending – so in terms of return they can produce a cluster of fat-tail days. One of his goals was to build risk systems that would enable the firm to survive market crises whilst maintaining the thematic, fundamentally driven investment style. The new risk management system and processes were introduced in January 2009. By then it was too late to impact what had been a traumatic period in 2008 – the Passport Global Strategy was down 38% in October 2008. The preceding events brought risk management to the front of the minds of everyone in the hedge fund industry. The clash of a medium-term investing style with a short-term liquidity crisis caused everyone on the investment team at Passport Capital to be in listening mode when it came to developments in risk measurement and risk management. Supplementing the firm’s macro and fundamental analysis, Garry’s team utilises a timing algorithm that is based on the work of market/technical analyst Tom DeMark (Passport Capital owns part of DeMark’s firm, Market Studies, LLC). The algorithm measures buyer and seller exhaustion. It is a means of picking up behavioural inefficiencies in markets and specifically contributes to forecasts of market turning points. For Passport Capital, timing is part of the risk/quant effort. This is a very unusual structural singularity in the hedge fund business, but perhaps is a contributory factor in explaining the acceptance of quant/higher-order risk management at the firm. A practitioner of quantitative techniques that is also able to deal with technical analysis is very rare too, and reflects Garry’s qualities. In running portfolios at Passport Capital, Burbank likes to see all three of the described elements at work reinforcing the current positioning – the top-down, the bottom-up and the quantitative or liquidity element. An example was in how the firm changed positioning in its portfolios in the middle of last year. Towards the end of 2011 Burbank was getting wary of markets, and had reduced the net long in the Global Strategy to a single-digit percentage. This positioning (and the small net short adopted in the first half of 2012) was in gear with how markets acted through the first half of 2012 – that is, the feedback loop of the P&L was consistent with the macro view. But the assessment of the liquidity prospects showed change. From early June 2012 it was clear the ECB was prepared to bail out Spain and act more like the US’s central bank, the Federal Reserve. Burbank says that Fed Chairman Ben Bernanke was expressing through his rhetoric an increasing willingness to do whatever it took to provide the right forms of liquidity to the financial sector. Normally the firm would be positioned at the top level as a function of a variant perception of economic growth – if Burbank foresaw higher economic growth than discounted by markets he would be long, and vice versa. However, the traded markets were beginning to ignore disappointing growth prospects in the middle of last year, and Burbank took on board that the liquidity factor provided by central banks was becoming dominant. Consequently the net was changed from a small short at the end of June to a net long of 55% at the end of the 3Q (100 L by 45 S), and the net stayed around that level through the end of the year. The 11% return for the Passport Global Strategy generated from this management of the net and the bottom-up security selection alpha put Passport Capital amongst the better equity hedge fund performers last year. Additionally, Passport Long/Short, an equity-only, highly liquid strategy that targets less risk, netted a 12.1% return. But the pattern of return for Passport Capital was the reverse of most equity managers in 2012. The bigger positive returns were made in the first half of the year, and the rest of the year turned out to be about holding onto the gain and setting up Passport Capital’s investment strategies for what 2013 has in store. This differential pattern of return is not uncommon in equity hedge funds with a significant macro input to the investment process – Odey Asset Management comes to mind in this context. Funds of this sort are excellent diversifiers from mainstream equity long/short hedge funds. 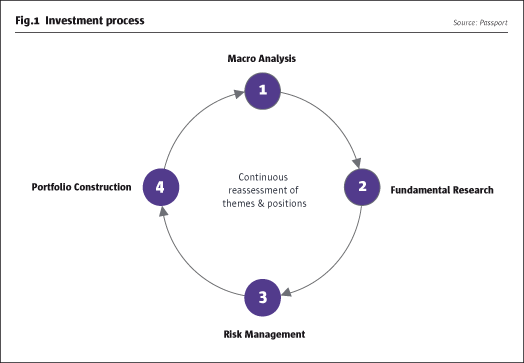 What has been described – a thorough, rational investment process that combines good analytical depth with practised (and overall successful) utilisation of macro considerations, plus a heightened awareness of risk measures and risk controls – hits several of the buttons for institutional investors in hedge funds. What is also significant is that Passport Capital has a robust and repeatable means of adding value (alpha generation), as this attribute is ranked higher than any other by such investors when deciding on allocating to hedge funds. Passport Capital has developed a high-end risk assessment capability. This enables the senior investment decision makers to decide on a rational basis when and by how much to change the level of risk taking in portfolios. For example, the decision to reduce the idiosyncratic short positions last summer was a tactical decision informed by a scenario-tested choice between closing hedging shorts or outright (for profit) shorts. The ability to see and implement top-down views has been at Passport Capital since day one, as that is practised and interpreted by Burbank. The capabilities to carry out bottom-up, sector, industry and company analysis in great depth have been built over time, but have been carried out by a stable core for some years. The third element of investing described by Burbank, risk/quant/liquidity, took a year to build in a system sense, longer to get embedded in the culture of the firm, but is now a natural part of how the investment team at Passport Capital addresses markets. The combination of these elements in a mature form has worked so well at his firm that Burbank considers it a template for how American hedge funds should develop. “Taking quant more seriously is what others have to do next," he says. "I see this as the future of hedge funds."